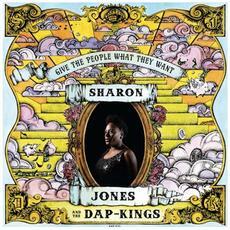 The 11-piece neo-soul team of Sharon Jones & the Dap-Kings are ready to release their fifth studio record. The group will give the public what they want by delivering Give the People What They Want on August 6th. You get pretty much what you expect with the new album. It's taught rhythm & blues with a heaping helping of showmanship on top. The record kicks off in fine form with "Retreat! ", a hearty number that you could easily see being covered by the Blues Brothers Band. The most memorable hooks come on "Making Up and Breaking Up", and the catchy handclap-inducing "Long Time, Wrong Time". The funkiest beats come on "You'll Be Lonely". There are some more laid back moments on the album as well. It's an easy, breezy vibe on "We Get Along". Horns stroll you along through "Get Up and Get Out", which feels like it should come complete with it's own hand-jive routine. Things wrap up all smooth and sultry-like with "Slow Down Love". The fast-paced tunes may very well be the best though. Be it the soul blitz of "Stranger To My Happiness" or the frenzied "People Don't Get What They Deserve", the heart needs to get pumping to fully enjoy the band. By now you know what to expect from a Sharon Jones collaboration with the Dap-Kings, and that's pretty much what you get with Give the People What They Want. No surprises means no disappointments. Best tracks: "Retreat! ", "People Don't Get What They Deserve"